Volant Cold Air Intake 1998-2003 Pontiac Firebird 5.75Johnny Vinson IIIApril 2, 2017have not installed yet but the experience so far has been great!! im replacing everything! so its all me for the delay in installation!! i can say that its the best looking air system on the market for my car that I have seen and actually cheaper to purchase!! i will update my review after install and let everyone know! !Thanks volant for the awesome design and look!! Volant Cold Air Intake 1998-2003 Pontiac Firebird 5.75MattJune 26, 2014I wanted to start off by saying how much I love how mean this setup looks!! Makes Loud sucking noises during quick low revs and jet plane sucking noise during wot!! Couldn't be more pleased.. When product arrived it fit but was so snug I had to file away some plastic on my BRAND NEW intake to make it fit well.. But after 5 minutes or less of filing it fit like a dream. I know a lot of people out there speak highly of slp.. Well I'd rather have this setup any day over the slp lid I had on my car.. I can honestly say I have a slightly faster throttle response now.. no increase in pull noticeable but the dress up from under the hood makes up for it all!! Thanks again Volant! Will return for intakes for future cars! Volant Cold Air Intake 1998-2003 Pontiac Firebird 5.74scottNovember 15, 2010The intake does look pretty cool but i couldn't get a perfect fit to the MAS. Otherwise it took about 1hour to install. I noticed a huge difference on the response. I t is worth the money for the gains. 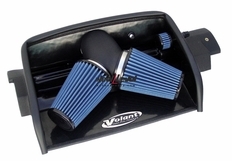 Volant Cold Air Intake 1998-2003 Pontiac Firebird 5.75M. MaxAugust 13, 2010First off, it looks sick. I love the two filters. It just looks high performance. Second, the install was too easy. I laid everything out prior to installing and once you've done that, the rest falls into place. Everything just attaches to factory parts. No moddind involved. Now onto the performance aspect. This is a great buy. My car sounds meaner. It has that old school rumble when its idleing. I also notice a gain in horsepower. Its quicker on the pedal. A great investment for anyone looking to upgrade their ride without going broke. 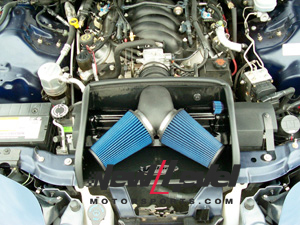 The part number for this Volant Intake is 15958C3 and it fits 1998-2003 Pontiac Firebird 5.7 models.